To beat or not to beat? That is the question editors at news organizations have to answer when they come into possession of anonymous attacks on political candidates. Today, Boston Herald editors chose the former. Rufus Gifford, former U.S. Ambassador to Denmark and current candidate in the MA-3 Democratic congressional primary, got whacked by the sketchy local tabloid in this Hillary Chabot column. 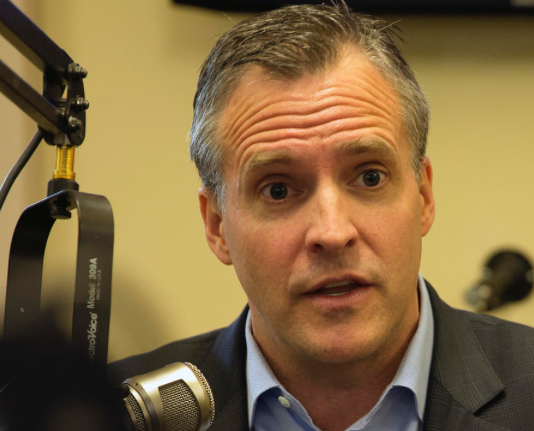 Top Democratic congressional contender Rufus Gifford says politicians “are pretty good at faking it,” discusses his lack of ties to Boston and details the exhausting process of walking a red carpet in a cringeworthy video released yesterday. The video, a compilation of Gifford’s own words from Netflix reality series “I Am the Ambassador,” was posted Saturday on an anonymous Dropbox account as an apparent political hit on Gifford. It casts him as an elitist outsider, complete with VIP access to New England Patriots owner Robert Kraft at Gillette Stadium. “If I was in L.A. or D.C., I’d probably know more people than I would in Boston ’cause I’ve never lived here as an adult and I’ve never worked here,” Gifford says while watching the game in a luxury suite. He then answers his cellphone. He likely also thinks it’s really unfortunate that the Herald decided to report on the video. To be sure graf goes here. To be sure, editorial calls like this one are tough to make, and the Dropbox video would absolutely be newsworthy if it came from one of the other candidates in the 3rd District race. But given the obscurity of the video and its questionable provenance, somehow this feels more like like the Herald making the news than reporting it. Two be sure graf goes here. Before any of you splendid readers level the same charge at the hardworking staff, please consider that 1) we’re engaged in media criticism, not reporting, and 2) we don’t have 40,000 readers. We should live so long.